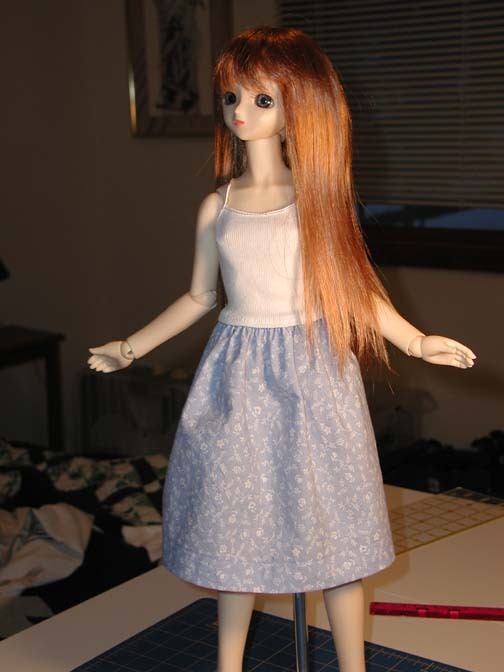 Many new Super Dollfie owners are very happy with their dolls, but soon find that it's not always easy to find clothing for them. While they do have beautiful body sculpts, sometimes they need to go out, and for that they really do need to be dressed! The answer for many people is to sew their dolls a wardrobe. Unfortunately, this only works if you already know how to sew. And while folks do want to learn, they have to start somewhere - and many of the patterns online can be intimidating if you've never sewn before. This tutorial is aimed at the beginner who has never sewn a doll garment before. I've included lots of pictures and probably painfully detailed instructions, but I'd rather give beginners too much information rather than too little. I've broken up this project into major and minor steps, with each one on its own page so as not to overwhelm those with slower connections. If you're reading through the project the first time, I would suggest following the links from step to step. But however you choose to access it, PLEASE make sure to read the Supplies and Things You Need To Know page. Even though I have shown all the details in constructing this simple skirt, I can't teach you all the techniques you'll need to know, for reasons I've explained there. It's very important you understand what you need to know before you start, so please read the page. Questions? Comments? Corrections? Please email me!